To determine the relative impact of three iso-caloric breakfast meals, of variable composition, on satiety, hunger and subsequent intake of energy. In a three-way, crossover design, 30 healthy men (age of 21.7 ± 1.2 years; BMI, 23.1 ± 2.7 kg/m2) were randomised to one of three test breakfasts, on three separate occasions, separated by 1 week. The breakfasts consisted of eggs on toast, cereal (cornflakes) with milk and toast, or a croissant and orange juice. Subjective ratings of satiety, hunger, fullness and desire to eat were recorded at 30-min intervals by electronic visual analogue scales (VAS). Energy intake was assessed by weighed food intake at an ad libitum lunch and evening meal. 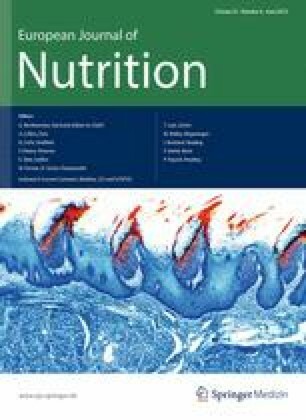 Participants showed increased satiety, less hunger and a lower desire to eat after the breakfast containing eggs relative to the cereal (p < 0.02), and croissant-based meals (p < 0.0001). The egg breakfast was also accompanied by a significantly lower intake of energy relative to the croissant- and cereal-based breakfasts at the buffet lunch and evening meal, respectively, 1,284 ± 464 (egg) versus 1,442 ± 426 kcal (croissant), p = 0.03, 1,407 ± 379 (cereal) at lunch and 1,899 ± 729 (egg) versus 2,214 ± 620 kcal (cereal), p = 0.02, 2,047 ± 712 (croissant) at evening meal. The breakfast meal with the greatest effect on satiety and subsequent intake of energy was distinct in having the highest protein and lowest carbohydrate content relative to the other two breakfasts. These findings provide evidence to support the importance of food choice at breakfast as a means of increasing satiety in the morning and reducing energy intake at lunch. This work was supported by a small undergraduate student project grant from the University of Surrey. Foods for the breakfasts, lunches and evening meals were purchased with the support from the British Egg Industry Council. Juliet Gray and Bruce Griffin have acted as scientific advisors to the British Egg Information Service. The study was originally conceived and conducted at the University of Surrey as an independent undergraduate research project. The authors did not receive any payment, or external input into the study design, interpretation of results or conclusions, or any financial support, other than that described above.